Ekornes’ Stressless Magic Office (M) chair comes from years of meticulous engineering to create the ultimate workday companion. The center crease creates a nest for your body while the Plus™ and Glide systems assure a perfect balance between cushion and support. With an endorsement from the American Chiropractic Association, this chair has been thoroughly tested and proven to provide great neck and back support. The wheels and 360 swivel mean you can navigate the office without strain. Spend your day focusing on your tasks and let the chair take care of your comfort. 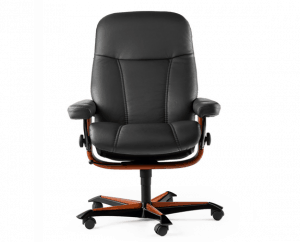 Customers buy the Magic Office (M) chair because it offers correct support to the neck and back, specifically the lumbar region. The Plus™ system responds to shifts in weight and makes adjustments ensuring your lower back always has good support. The Glide balances your bodyweight so you’ll never hold tension in your muscles to get the angle you need. Comfort Zone technology means the soft cushion also provides proper support for your muscles. The wheels and 360 swivel complete the experience making this chair ideal for any office. Invest in your body by providing it with proper support during the long work days. Every hour spent at the office is an hour your neck and back are working to support you. With its state of the art ergonomic design, the Magic Office (M) will give your body the support it needs so you can be your best. We ship to any address in all 50 United States. Ask for details regarding shipments to Canada. For quality assurance, all Magic Office (M) shipments must be insured for accident, loss, or damage. Once your shipment leaves our facility, a tracking number is provided via email. Unless otherwise stated, delivery means “to your door”. Shipments must be signed for by someone over 18 years of age. Ekornes has been creating furniture in Norway for more than 80 years. In 1971, Ekornes launched their Stressless recliner using the newest technology available to enhance comfort. Over the years, they have developed the Plus™ system and Glider system to create a recliner that adjusts to the needs of each individual. The adjustable Ottoman completes the comfort of the Ekornes Stressless recliners making them the premier recliner in the home furnishings market.